We Offer Parking Lot Painting and More! The eSquared Asphalt Maintenance team works diligently to provide Waco and Temple, TX with professional parking lot coating and maintenance. Our trained, seasoned professionals are knowledgeable in local and state codes and guidelines. For expert parking lot painting and maintenance throughout the surrounding areas, call our professionals at 254-716-8685. Our experts are trained and experienced in all types of parking lot and pavement painting and marking to ensure that you get the exact service you need. We will guide you through the material options providing details like cost, benefits, and lifespan while providing procedure explanations and descriptions so you are always in the loop. Our services are always EPA and ADA code compliant, to ensure that you’re not hit with penalties or fines. 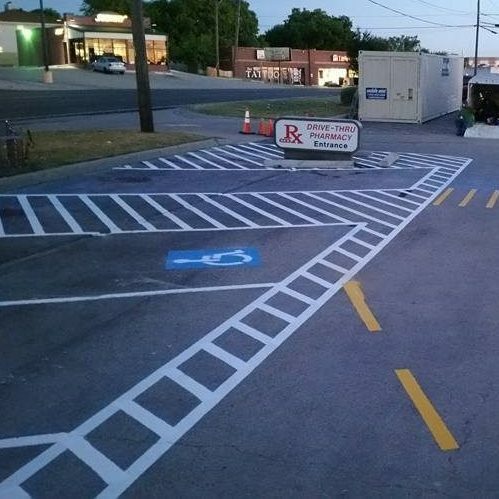 Our comprehensive parking lot painting in Waco and Temple, TX will revive and re-energize your parking lot while providing safety and compliance for your business. Whether you’re adding a walkway through your backyard or you need driveway repair, our experts have you covered. Our extensive knowledge of concrete installation and care allows us to create completely unique works of art in your space as well as repairing and restoring your current structures. Our professionals can restore your old, drab concrete with a personalized overlay or we can repair and seal your concrete to create a natural look that’s protected for years. Not only can our team effectively wash your parking lots and concrete, but our trained professionals can also pressure wash any material without leaving streaks or marks and can reveal a more energized, fresher appearance. When you need pressure washing, paving, or parking lot painting services in Waco and Temple, TX, our professionals are here to help. Contact us today at 254-716-8685 to find out more about how our services can benefit you. Updated on March 21, 2019 at 10:38 am by eSquared Asphalt Maintenance.